Northborough – Virginia B. 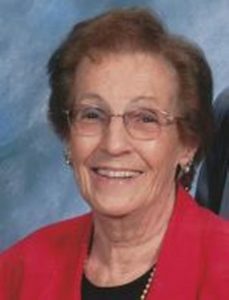 (Brown) Smith, 89, a longtime resident of Northborough and retired registered nurse, passed away Nov. 12, 2018. Jinny was born in Biddeford, Maine on March 31, 1929. She grew up in Worcester; the adopted daughter to Harold and Elizabeth (Maxwell) Brown. She graduated from the former Northfield High School for Girls in 1947 prior to enrolling at New England Baptist Hospital School of Nursing where she earned her Bachelor Degree of Nursing. In 1952 Jinny married Richard D. Smith, a marriage that would last 58 years until Richard’s death in 2011. The couple lived in Holden for 5 years prior to relocating to Northborough in 1958. In addition to being dedicated to her family’s needs, Jinny worked at an RN at Shrewsbury Nursing Home, Beaumont Rehab and Skilled Nursing Center of Northbridge and Christopher Heights Assisted Living in Attleboro. Jinny was a longtime active member of the First Baptist Church of Worcester. Jinny is survived by four children, Douglas G. Smith and his wife Theresa of Mansfield, Steven R. Smith and his wife Mary of Northborough, Craig R. Smith of Northborough, and Karen Smith of San Diego, Calif. She was the loving grandmother to Heather, Thomas, Michael, William, Stephanie, Nathan, Matthew, Magdalena and great-grandmother to Dylan, Liam, Hayden, Preston, Jacob, Sophia, Gabriel, Reece. Jinny was looking forward to the arrival of her ninth great-grandchild in February. Calling hours will be held Sunday, Nov. 18, from 12-2 p.m., at Hays Funeral Home, 56 Main St., Northborough. Jinny’s funeral will be held Monday, Nov. 19, at 10 a.m., in the First Baptist Church of Worcester, 111 Park Ave,, Worcester. She will then be laid to rest beside Richard in Howard Street Cemetery of Northborough. Memorial contributions in Jinny’s name may be directed to the Alzheimer’s Association, 309 Waverley Oaks Rd., Waltham MA 02452.